More than a State of the Art Financial Centre®... it's a "New Business Model" in the Financial Arena. Delivering true client Convenience by providing a Full Complement of Financial Services, all under One Roof, in One Location. Plan for Financial Independence... You've come to the right place! Review your Financial Plan and Investments... We can help! Do your Banking?... We have it here! Want to Buy a Home?... We can help you do it! Need Home Insurance or Auto Insurance?... Got ya covered! Want to provide for your Family when you Die, become Disabled, or confined to a Nursing Home?... We can help! Send your children to College without debt?... We can help you plan! Need your taxes done?... No problem! 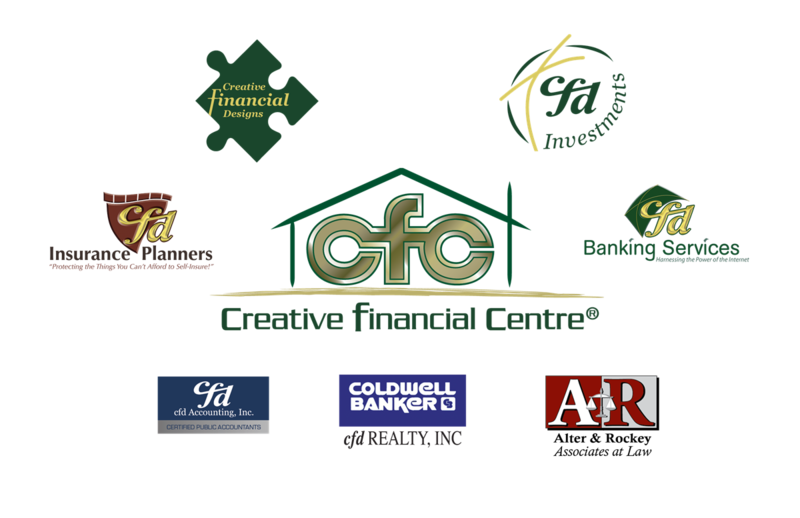 Come enjoy this wonderful world of One Stop Life conveniences and client services all at the Creative Financial Centre®. Stop in today to see all we have to offer! Delivering the same Christian business principles of 40 plus years in Kokomo... Home of the cfd Family of Companies. Creative Financial Centre® is a large facility with a wide range of rooms that are available for rent for any type of event that you may have. Call us today at 765.453.9600 and ask for Chennel Lindsay, or check us out on Facebook! We look forward to serving you and your event planning needs.